60 Deaf Bar/Bat Mitzvot in Yerushalayim! Home » IYIM NEWS AND EVENTS » 60 Deaf Bar/Bat Mitzvot in Yerushalayim! Annual Bar/Bat Mitzvah is once again a success! 60 Deaf and hearing impaired young adults from all over Israel participated in the annual Bar/Bat Mitzvah celebration ceremony organized by the International Young Israel Movement (IYIM) on May 7th, 2018 in the Beit Yaakov Synagogue in Jerusalem. This event was held in cooperation with Acha (The Association of the Deaf in Israel) and Shema (non-profit organization dedicated to the advancement of children with hearing loss and to their integration into society). This year’s program was named in loving memory of the recently deceased Ceec Harrishburg z”l, the founding President of IYIM. His wife, Tema, along with his children, grandchildren and many friends, were in attendance. Upon arrival, the participants and their families were entertained by Gustavo the Magician as buses arrived from the North, South and central regions of Israel. Then, celebrants went into the Beit Midrash of the synagogue for their final preparatory shiur before the ceremony, while their families, teachers and madrichot settled into the main sanctuary. The B’nei Mitzvah ceremony began with opening words given by Daniel (Mush) Meyer (Executive Director, IYIM), Orit Schreiber (National Programs Director, Shema) and Etty Schwartzberg (Director, Acha). Followed by gifting the celebrants with Siddurim, Tefillin bags, and candle sticks to the boys and girls, respectively. 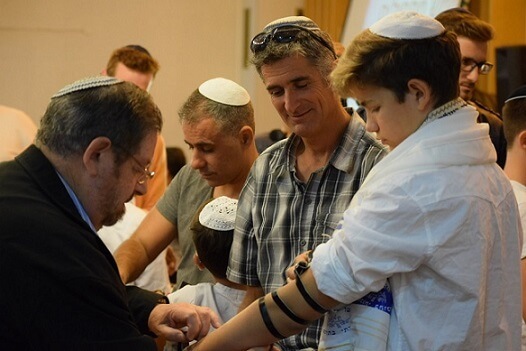 Then it was time for the ceremony to start – the Sefer Torah was taken to the bimah while the young men put on Tefillin and were called up in two groups to recite the brachot. Meanwhile, the young ladies were given a short explanation on the importance of bat mitzvah and were also called up to reaffirm their faith. Spontaneous dancing and singing proceeded. 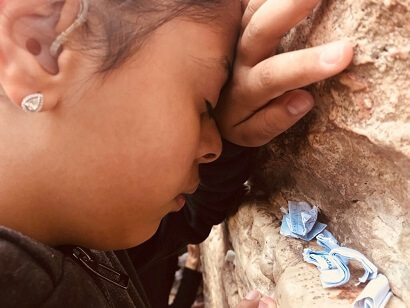 The ceremony was followed by a lavish celebratory lunch and continued with a tiyul exploring the Old City of Jerusalem and ending at the Kotel HaMaaravi. Sign language interpretation was provided on the trip. “Thank you so much for an amazing day and unforgettable experience!! You made us feel belong and let us socialise and feel alive!! Thank you for such an incredible, wonderful, amazing day!